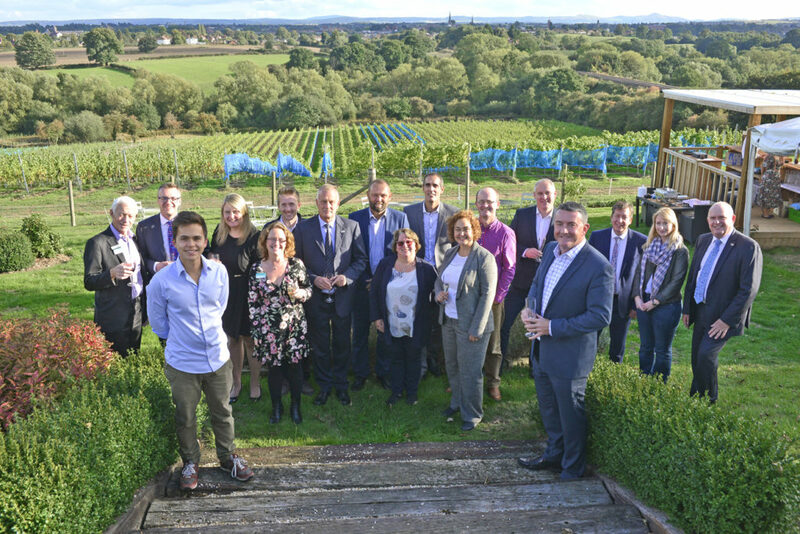 Patron members and guests of Shropshire Chamber of Commerce visited Hencote Estate vineyard on the outskirts of Shrewsbury where they were treated to canapés, a tour of the vines and sample tasting of some of the very first wines produced. Hencote Estate is a multi-million pound investment in the county by Andy Stevens and his family and features 16 acres of planted vines on elevated slopes overlooking the town, scheduled to be in full production by the end of the year. General manager Mark Stevens, commented: “We have literally just started harvesting the grapes and the bespoke winery, currently nearing completion, will also feature a wine bar and restaurant boasting unrivalled panoramic views of the town’s skyline. “We are delighted to be hosting the chamber patrons and their guests and appreciate the opportunity to showcase the on-going developments on site of what we believe will become a major tourist attraction for the county. Patrons chairman Nick Jones, added: “We are grateful to Hencote Estate for its hospitality and for allowing us a brief guided tour of this amazing vineyard development, which will eventually boast unrivalled facilities and totally unique views of the county town.